The Flag raising ceremony on Saturday attracted hundreds with provincial and national flags including face paints in red, black and gold to mark the 42nd Independence Day. The people turned up as early as 5am to witness the flag raising ceremony at the Independence Hill in Port Moresby. 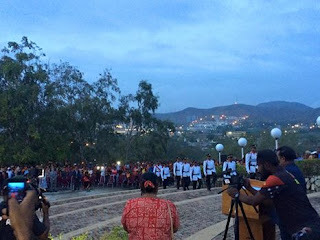 Disciplinary forces, girl guides and boy scouts including students braved the early morning to welcome the guest speaker Prime Minister Peter O’Neil and other guests. At the flag raising ceremony, Prime Minister Peter O’Neil told Papua New Guineans to focus on the future and what they can do to play a part in the development of the nation both as individuals and in the communities. better work with the regions in the delivery of core Government services”PM O’Neill said.